Philanthropy has always been a key ingredient in Australia’s medical research success. It was a bequest from racehorse trainer Jack Holt that founded SVI, and support from other generous donors has allowed the subsequent expansion of the Institute, the development of ground-breaking research and the acquisition of cutting-edge technology for our research. Australia’s medical research excellence is acknowledged world-wide, and in large part this is thanks to these generous individuals who unwaveringly support research. The role of philanthropy is even more important at the moment, with the sector particularly vulnerable to inconsistent funding. This issue was particularly compelling with the announcement of the NHMRC Project Grant outcomes in October. Project Grants are the main avenue of support for small teams of researchers, and four SVI teams were successful in this year’s round. National success rates for the scheme were 15% - this means that only one in six applications was funded, even though almost 50% of grants were judged to be of sufficient merit to deserve funding. Acknowledging the high standard and importance of medical research to Australia’s future, and the funding issues faced by the sector, the Australian Government proposed the creation of the Medical Research Future Fund (MRFF) in the 2014 budget. And while the future of the MRFF is being debated in the Senate, philanthropy plays an even more important role than ever in bolstering Australian research and in bridging the funding gap. 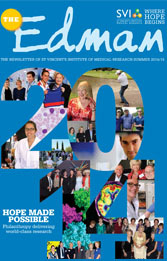 As you will see in this issue of the newsletter, philanthropy has been hugely influential at SVI in 2014 –supporting our people, with the Susan Alberti Women in Research Award, funding important infrastructure such as the SVI Biobank, and funding cutting-edge Alzheimer’s disease research. No matter what the coming year brings, philanthropy will continue to play a vital role at SVI, with generous individuals and organisations helping to sustain one of Australia’s most vibrant and successful sectors. I would like to wish happy holidays to all of you and thank you for your support in 2014. I look forward to keeping in touch with you in the New Year. In 2014, philanthropy has been crucial in helping SVI achieve its goals of improved health through medical research. Some of the highlights of 2014 are listed below. Originally seed-funded by a $5million donation from Susan Alberti, the Nationally Funded Centre for Islet Transplantation at St Vincent’s was opened in 2014 by Health Minister Peter Dutton. Funding from the Marian and E.H. Flack Trust allowed the completion of SVI’s Biobank project, also supported by a $300,000 donation from the Helen MacPherson Smith Trust in 2011. The Susan Alberti Medical Research Foundation’s Mother’s Day Luncheon raised money in May for the 2014 Women in Research Award, presented to Dr Sophie Broughton from the Structural Biology Unit. Funds raised through events held by the SVI Foundation, including the Australia Day celebration at the Bellarine Peninsula and the SVI Charity Golf Day, have raised vital funds to support research at the Institute. The $10,000 Discovery Fund has a capital target of $5million, the income from which will support research at SVI. 2014 saw SVI’s $10,000 Discovery Fund gain six new members, with another two members renewing their pledge of support for a further 5 years. In addition, significant donations to the Fund were made following two superb functions in March and October. Support from charity-based organisations such as Diabetes Australia, Australian Cancer Research Foundation, Cure Cancer Australia, Leukaemia Foundation, National Breast Cancer Foundation, JDRF and Cancer Council Victoria continues to be crucial to SVI research. The year kicked off with SVI’s Professor Michael Parker and colleagues from the Centre for Cancer Biology being awarded a $6.7million Program Grant from the National Health and Medical Research Council to find new ways to treat leukaemia. Associate Professor Louise Purton continued work on her project to develop methods of improving the outcome of human stem cell transplants thanks to a $100,000 Adult Stem Cell Grant from the Sydney Catholic Archdiocese. In April, Health Ministers Peter Dutton and David Davis opened the Institute’s Nationally Funded Centre for Islet Transplantation, which aims to deliver islet transplantation to people across Australia suffering from life-threatening type 1 diabetes. Highly-publicised work from Dr Stuart Mannering and Professor Tom Kay described how the team from SVI’s Immunology and Diabetes Unit were, for the first time, able to catch the immune cells responsible for causing type 1 diabetes ‘at the scene of the crime’ – by isolating them from the pancreas of an organ donor who had died due to complications of the disease. Research from Dr Carl Walkley and his team explained how the gene Recql1 works. Responsible for the rare human cancer syndrome, Rothmund-Thomson Syndrome, Carl showed that Recql1 also plays an essential role in the development and maturation of normal blood cells. On the fundraising front, the SAMRF Gala Ball in August raised $150,000 for diabetes research at SVI, the SVI Support Group raised more than $60,000 at their annual dinner and the 2014 SVI Golf Day in October raised $70,000 for Institute research. The Marian and E.H. Flack Trust recently announced that SVI had been awarded a $150,000 grant. The grant will help to complete the SVI Biobank Project, which was kicked off in 2011 with a $300,000 donation from the Helen MacPherson Smith Trust. Representatives from the Flack Trust visited the Institute in October and heard from past recipients of funding, Drs Tom Brodnicki and Craig Morton, who described how equipment purchased with past support from the Trust has expedited their research. During their visit, the Trustees noted the parallels between the life of Edwin Flack, and that of Jack Holt, SVI’s benefactor. Both were outstanding sportsmen: Jack Holt was a jockey and prize-winning racehorse trainer, and Edwin Flack was Australia’s first Olympic champion, winning Gold medals in the 800 and 1500m races at the 1896 Olympic Games in Athens. A modest man, Flack was studying accountancy in London when he decided to compete in the Olympics and told neither his family, nor his boss, the purpose of his month’s leave. Flack followed his Olympic triumph with a successful business career in Australia, building up an accounting firm with his father, which later became PricewaterhouseCoopers. Just like Jack Holt, Flack died a bachelor, and wanted to dispose of his assets in a way that would benefit those in need. The Marian and E.H. Flack Trust was established upon Flack’s death in 1935, and in the last 10 years alone has disbursed more than $17 million. More than a century after their births, and thanks to their foresight and generosity, the legacies of Edwin Flack and Jack Holt live on within the walls of SVI. Alzheimer’s disease is the most common form of dementia. More than 300,000 Australians live with dementia today, and the number of people with Alzheimer’s disease is expected to triple by 2050. The financial cost of Alzheimer’s, currently estimated at AU$3.6 billion per year, will continue to grow unless medical research can intervene with new and effective therapies. With this pressing need in mind, in 2014 the Yulgilbar Foundation, founded and advised by Sarah and Baillieu Myer, announced an initiative to support research aimed at combating Alzheimer’s disease. In October, the Foundation awarded a $170,000, 2-year grant to SVI’s Professor Michael Parker and Dr Luke Miles. Luke says that their research is focused on the early stage discovery of drugs to stop the accumulation of toxic peptides that drive the disease. Luke explains that their project focuses on a protein called CD33, which is thought to inhibit the clearing of beta-amyloid accumulation in the brain. The team will use their expertise in determining the 3D structure of proteins to guide the development of drugs to block CD33 and hopefully halt progress of the disease. The determination of philanthropic organisations like the Yulgilbar Foundation, combined with support from the government in the form of a recently announced $200 million funding boost, greatly increase our chances of finding new treatments for Alzheimer’s. Dr Alistair Chalk is a bioinformatician working in the Stem Cell Regulation Unit. Having trained in computer science at Auckland University, then bioinformatics at the Karolinksa Institute, Alistair now uses his expertise in information technology to help interpret large and complex biological datasets. My childhood was spent… sailing and playing sport. My first job was…working at a chemist. My worst job…is a distant memory. My happiest moments are… when I'm completely in the moment. I got into research because…I was inspired to use computers to understand how we function. The people I most admire in science are…those that aren't afraid to challenge the current dogma. If I wasn't doing research…I would be spending time learning and teaching others. If I could live anywhere…I would choose to follow the summer, living between Europe, Australia and New Zealand. SVI researchers secured more than $3million in the most recent round of funding announced by the National Health and Medical Research Council (NHMRC) in October. The NHMRC’s Project Grants are the main avenue of support for individuals and small teams of researchers undertaking biomedical, public health and health services research. Successful in this year’s round was Associate Professor Natalie Sims, whose research will investigate new ways of treating osteoporosis. A 5-year grant to Professor Bruce Kemp will allow the team to continue their ground-breaking work on the protein AMP kinase (AMPK), the body’s master energy gauge. Dr Mark Chong, Head of the Genomics and Immunology Laboratory, was awarded a grant to investigate the role of regulatory molecules called microRNAs in biological processes. Finally, Dr Carl Walkley and his team will continue their world-class work on the bone cancer osteosarcoma, with a grant to identify and test new treatments for the disease. In August the NHMRC also announced recipients of their Fellowship Scheme, which are awarded to outstanding health and medical researchers conducting work of major significance to their field. Professor Bruce Kemp continued his funding success with a 5-year Senior Principal Research Fellowship. SVI researchers were also successful in this year’s round of Diabetes Australia research grants. Four grants of $60,000 were awarded to Institute researchers Tom Kay, Esteban Gurzov, Andrew Sutherland and Jock Campbell to continue their work on the prevention, management and treatment of diabetes. Ray was diagnosed with type 2 diabetes when he was 57. “I was diagnosed with type 2 diabetes in 2004, following a routine GP check-up. He was quite angry as he relayed this news as on previous visits he had issued warnings that my weight and dietary habits were contributing to a high indication of future diabetes, and drastic life-style changes could prevent this happening. Now the worst had happened. However, following his rigid dietary guidelines led to severe bouts of gout (ouch! ), so I had relapsed into my former habits. Before diagnosis, I suffered semi-regular dizzy spells, ocular disturbances and significant leg pain. As far as my family history is concerned, all I know is that my father (same body shape, same penchant for snacking, same avoidance of health check-ups) died suddenly and unexpectedly at the age of 69, and I feel that he may have been an undiagnosed diabetic. I accepted the diagnosis and consider it a controllable medical condition. Life goes on. Medication twice daily, and frequent finger-pricks are just a part of my daily routine. The condition seems to be reasonably controlled and I do have regular medical check-ups, including visits to the podiatrist and eye specialist. Incidentally, I have never smoked and rarely drink alcohol, and neither did my father. Interestingly, my bout of prostate cancer in 2008 really did scare me. Without even trying, I lost a significant amount of weight and became relatively fit – so much so that the diabetes educator at the hospital said I no longer came under the ‘diabetes umbrella’. I am now cancer free, but the diabetic indicators returned with a vengeance. I know if I lost weight (maybe up to 15 kg), exercised more and managed my diet more carefully, I might not have to take as much medication. I am trying but I feel quite fine and as I said before, life goes on. Researchers in SVI’s Protein Chemistry and Metabolism Unit are working towards new treatments for type 2 diabetes, focusing on a protein called AMPK. Simply put, AMPK passes a “make more energy” message to the cell when needed. By doing so, it regulates the burning and storage of fats and sugars, and affects the level of sugars and cholesterol in the blood stream. This is what makes it such a promising target for the treatment of metabolic diseases such as type 2 diabetes. Professor Bruce Kemp and his team are at the forefront of this research. This year’s SVI/Macquarie Leasing 2014 Charity Golf Day, held on Monday 20 October, raised an incredible $70,000 for SVI research. 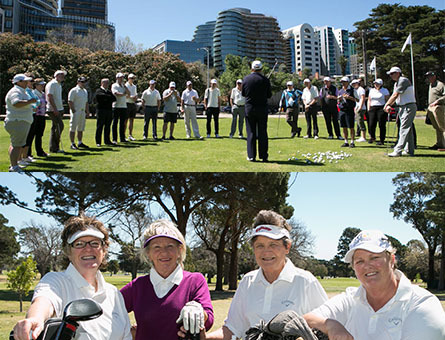 The event was held at Albert Park Golf Course on what turned out to be a beautiful spring day, with 19 teams taking full advantage of the sunny skies and soft breeze. The Australian Reliance team of Matthew Kohler, Michael Roberts, Gareth Nicholls and Jarrod Watson won the Jack Holt trophy for finishing first on the day. Runners up were Carrie Pleasance, Chris Howord, Peter Benroison and Garrith Ridd from Garuda Indonesia. The Michael Dwyer Memorial Trophy was won by Chris Holroyd from Charter Keck Cramer, for the long drive on Hole 6. “What a great turn out,” said SVI Director, Prof Tom Kay. “We’re really grateful to Macquarie Leasing, Platinum Sponsor for this year’s event, and to all sponsors and players for the enthusiasm and sportsmanship shown on the day. Silver sponsors for this year’s event included Garuda Indonesia, Maxxia, PanPacific and Jayco. The Inaugural Jack Holt Charity Breakfast on Friday 24 October at the RACV Club in Melbourne was, by all definitions, a great success. Many guests and participants at the breakfast didn’t know that SVI was established as a direct result of racehorse trainer Jack Holt’s bequest of £200,000 - all acknowledged that his contribution to Victoria’s racing and medical research efforts was inspirational. Funds raised at the event, organised by Rotary Club of Brighton and the Susan Alberti Medical Research Foundation are to be shared between SVI’s Alzheimer’s research program and the Ardoch Youth Foundation. MC Simon Marshall hosted an action-packed program, kicked off by race caller Victoria Shaw—Australia’s only female race caller—who got everyone into the racing spirit with a ‘phantom’ race call. Simon then introduced the star-studded speakers’ panel which included Ron Hutchinson, Michelle Payne and Colin Madden, who shared anecdotes about their experiences in the world of racing from their different perspectives of trainer, jockey and part-owner of a champion race-horse. The Fashions on the Field judges—Alex Fevola, Alan Pinkus and Richard Nylon—also helped make a colourful and engaging event. The SVI Support Group celebrated 25 years since their inauguration at their annual Black Tie Dinner in October at The Athenaeum Club. Their stellar fundraising effort on the night brings the total raised by the Group to close to $350,000. At the start of the evening, Claire O'Callaghan thanked former SVI Director Professor Jack Martin, who originally suggested that they direct their fundraising towards Student Scholarships. SVI PhD student, Alvin Ng, who spoke on the night, noted the difference that the SVI Student Scholarships make to students at the Institute. "Although most PhD students receive a scholarship from the Australian Government or the University, the living allowance is three quarters of the minimum wage. Also, as a PhD student, most of our time is devoted to working on our projects. This means that, even if we need to get paid work, we would be eating into precious time that could be spent on our research. This is why the SVI Foundation Top Up Scholarships are a lifesaver. With an additional $5000 per year, I do not have to worry about keeping a roof over my head or putting food on the table. Most importantly, I can focus my time on my research projects, which means getting closer to the answers that our research aims to resolve." The night also presented an opportunity for SVI to thank the Group, and in particular note the effort of seven members who have been members since the first event at the Regent Hotel in August,1989. SVI would like to acknowledge all those who have donated to scholarships at the Institute, and especially thank the SVI Support Group for a quarter of a century of support.